Anjar encompasses the ruins of a former Umayyad trading city. It was founded on a strategic location between Baalbek and Damascus. Umayyad Caliph Walid I started its construction in 714. The city was never completed, and destroyed and abandoned already in 744. The layout of Anjar was heavily influenced by Roman planning. Two meter thick walls contained the 114,000 square-meter city. It had forty towers and a gate. The city held over 600 shops, a Roman grid, a monumental tetrapyle, the Umayyad Palace, a mosque and a hammam. 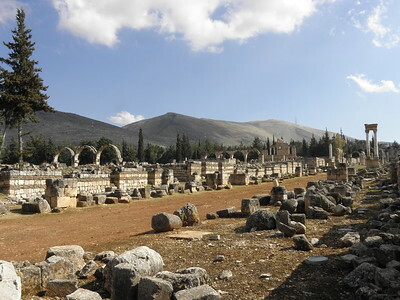 The ruins of Anjar were only uncovered by archaeologists in 1949. At turbulent times in recent Lebanese history, Anjar was a difficult site to visit. Even now, in the calm 2010's, the Dutch Ministry of External Affairs warns against going there. The site is located only a few kilometres from the Syrian border. It was used as a Syrian militairy base during its long involvement with the politics of neigbouring Lebanon. Everything was very quiet though when I visited in early April 2012. I guess the Syrians are too busy with themselves at the moment. Having just visited Baalbek, Anjar comes across as a lesser example of Imperial Roman architecture. In fact it is from a much later date, the 8th century: the engineers just used a lot of Roman and Byzantine examples. The most impressive is the strict layout of the city, with a north-south and an east-west axis. At the crossroads there is a perfect example of a Tetrapylon. The story here is that all small compartments along the axes were used as shops, hundreds of them. That would have made the city one huge shopping mall. I wonder were all the people came from who bought stuff here. We spent about 45 minutes at Anjar archeological site (I was with a tour from Beirut). That was sufficient for me, it is mostly ruins that you can see. Besides our group of 6 a few other foreign individuals were visiting at the same time. The site is very low key: it lies on the edges of the modern village which is inhabited by Armenians. The landscape reminded me a lot of Armenia also: the mountains in the background, the agricultural fields, the simple village life. 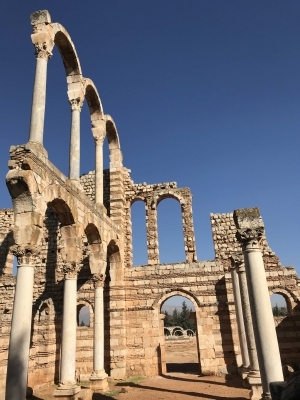 Even though Ivan and I both agreed Anjar is one of the less exciting world heritage sites of Lebanon, but given the overall impresiveness of the heritage of Lebanon overall, it means a lovely and a very interesting visit. You can go either by organized tours from Beirut, or just rent a car and drive yourself around all of Lebanese WHSs, though be careful, Lebanese are quite some drivers and not fond of using indicators. Anyway, Anjar lies in the Bekaa valley, about three kilometres away from the Syrian border. The population of the town is, as I've later learned, almost completely Armenian (they ran away here from the Armenian genocide of 1915). The WHS is 8th century Umayyad town that has kept to the tradition of Roman city planning with two main streets perpendicular to each other. It's a lovely architectural park to walk around. There are info boards scattered around in English at important parts of the site. We made it around 10 a.m. on Saturday morning, along with a busload of European tourists, so the place was a bit crowded, so if you want to have it to yourself, arrive a bit earlier. But it's stil more off the beaten track, at least according to the Lonely Planet, which doesn't have Anjar listed at all. And from Anjar, follow on to the Baalbek. Not the other way around, Anjar will be a bit underwhelming. We reached Anjar from Damascus coming from a round trip thru Syria in early April 2006. Anjar was our first WH site in Lebanon just a few miles from the Syrian border. It was particularely breathtaking seeing the snowtapped Lebanon heights forming the pitoresque background to the remains of the palace of Calif Walid. Only 3 month later all TV news were showing the bombs on the very road we had just used. Similar barbarian acts jeopardized or even damaged the other lebanise WH sites. What a shame!